Panna cotta must be one of my favourite stand-by desserts because it is so versatile and easy to make. Its creamy taste and softly-set texture make it the perfect companion to other fruit desserts. However, panna cotta can be absolutely wonderful even as the starring role of a dessert. One of my contribution to the Valentine's Day dinner at Linda this year is Panna Cotta with Maple Gelee. The panna cotta is spiced up with a healthy swig of dark rum which complements the wintery flavour of maple. This dessert is rich in flavour yet the taste is light. I guarantee that you'll not feel bloated even after a romantic dinner for two. After all, nobody wants to feel like eating too much on Valentine's Day, right? Bloom the gelatin with 2-3 tbsp of water in a small bowl. In a small sauce pan, combine cream, milk, and sugar. Bring to a boil and remove from heat. Using 5 second intervals, microwave the gelatin mixture until it becomes clear. Stir gelatin and rum into the cream. Divide mixture into containers. Chill until the panna cotta is set. Bloom gelatin with 2-3 tbsp of water. Bring water to a boil and combine with maple syrup. Using 5 second intervals, microwave the gelatin mixture until it becomes clear. Stir gelatin and maple essence into the thinned maple syrup. Divide mixture to layer on top of the already set panna cotta. 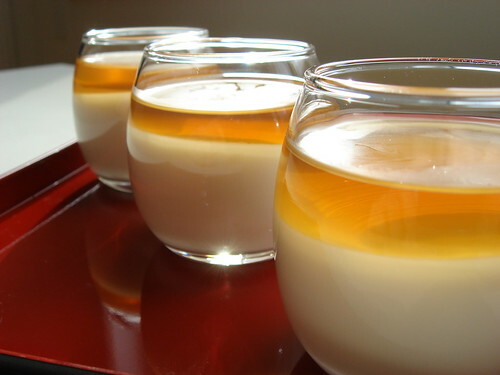 Since the panna cotta is very lightly set, I would recommend you to pour the maple liquid very gently, preferably against the side of the container instead of directly on the panna cotta. Otherwise, the maple gelee will be clouded with debris from the panna cotta. Chill until the maple gelee is set.